If you don’t want to call it a “bubble,” that’s up to you. But it’s clear that what’s happening in Silicon Valley is different from what’s happening just about everywhere else: The optimism of the start-up economy seems endless, and investors will throw money at new companies just as quickly as they’re founded. Three of the area’s most interesting entrepreneurs join us to share their take on the Valley’s culture and commerce, and how they’re trying to export that as they venture into Asian markets. Dave Goldberg had already built a successful company — Launch — before selling it to Yahoo; now he’s trying for a second act with SurveyMonkey’s very profitable self-serve surveys. Sukhinder Singh Cassidy traded a high-flying job at Google for a chance to build her own company at Joyus, a new take on e-commerce. And Brian Chesky’s Airbnb has become one of the era’s iconic success stories: the vacation rental service seems to have moved from concept to billion-dollar hit overnight. 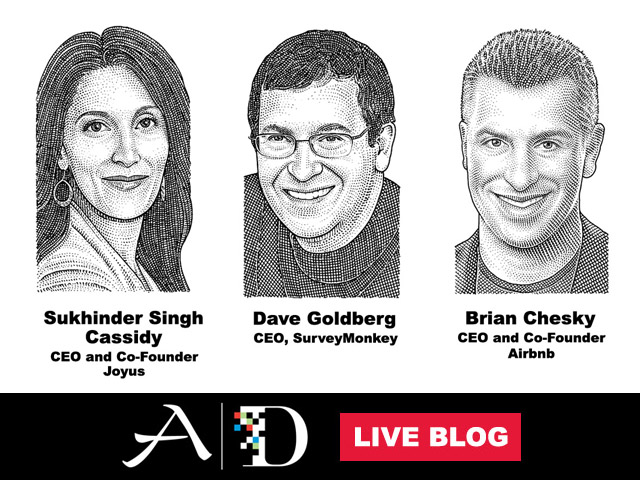 1:52 pm: Peter Kafka takes the stage followed by SurveyMonkey’s Dave Goldberg, Joyus’s Sukhinder Singh Cassidy and Airbnb’s Brian Chesky. “This is relaxing because I don’t have to ask you whether you’re buying or selling Yahoo,” Peter quips. 1:53 pm: A first question about the bubble in Silicon Valley: Why are so many people throwing money at companies like the ones you people run? Are you aware that what’s going on in Silicon Valley doesn’t really look like the rest of the world? Airbnb’s Brian Chesky’s fields this one, but answers it with a pitch for Airbnb. Peter circles back and puts the question to him again. 1:57 pm: Peter moves on to Joyus’s Sukhinder Singh Cassidy who seems more willing to answer the question at hand. 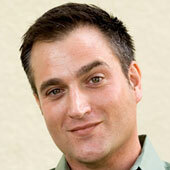 2:05 pm: Question for Airbnb’s Brian Chesky: Is anyone counseling you to scale back your rounds? Chesky says no. Talks a bit about investing ahead of growth. Chesky explains that Airbnb is opening lots of local offices around the world. The company is also investing quite a bit in product and in marketing as well. 2:07 pm: In the first bubble, the idea was to go public. That phenomenon doesn’t exist anymore. Does the fact that there really isn’t an IPO window anymore affect your planning? 2:09 pm: Do you think we’ll see a boom in start-ups in Asia, or do you think there’s something special about Silicon Valley? Chesky believes we will. He notes that there are start-up cultures emerging abroad, in Berlin for example. Sukhinder Singh Cassidy says she sees huge pockets of innovation in lots of emerging markets. But she notes that many of the entrepreneurs in those markets got their “sea legs” in Silicon Valley. “What I see now is people who’ve lived in the Valley moving back to these emerging markets and bringing their experiences back with them,” she says. 2:16 pm: Can a guy in a garage still build a successful company? 2:19 pm: Question for Chesky: Can you extend your business model into other categories? Absolutely, says Chesky. He talks a bit about how Airbnb has already expanded to more categories (whole-home rentals, sublets, boats, cars etc.). 2:24 pm: How do you bring your success in Silicon Valley to Asia? Goldberg says it’s all about talent: It’s hard to hire people locally and it’s even harder to hire them abroad. So really, you need to tap into the entrepreneurs around you. … It’s a real challenge in places like China. It’s definitely not easy. 2:30 pm: That’s it. Up next, a demo from Kibot.